Today I would like to share 10 supplies that make practicing elimination communication easier. I could have called this checklist "Must-Haves for EC", but all you truly need to practice elimination communication is a baby. You may have jumped right into practicing EC by simply holding your baby over the toilet and making a cue sound. But pretty soon you are likely to start searching for some useful tools. I recommend the following elimination communication supplies. A small potty is especially useful when starting elimination communication with a young baby. If you are practicing EC with a newborn, you can hold your newborn over a Top Hat Potty or the insert from a BabyBjorn Smart Potty . Once your baby can sit up, he can sit on the little potty either with your assistance or on his own. Small potties are perfect for keeping in convenient locations, like the bathroom, next to the bed for nighttime EC, or wherever your baby happens to be in the house. Especially if you live in a cool climate, you may want to get a potty cozy, which is a piece of fabric that fits around the potty seat, to keep it warm. This can be a big help if your baby is refusing to sit on the potty because the seat is cold. A toilet seat reducer is a wonderful EC tool once your baby can sit upright. My six-month-old was so proud to sit on the toilet and look around at everything in the bathroom. The Bumbo Toilet Trainer is a comfortable option. The Potette Plus 2-in-1 works as a toilet seat reducer or stand alone potty, while out and about away from home. 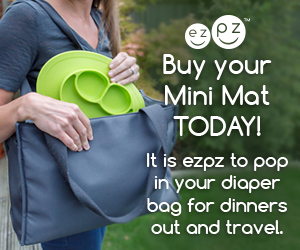 When using it in the potty configuration, you can line it with a disposable liner or a collapsible reusable liner. Just be sure to test the Potette Plus to make sure your baby is big enough. My baby almost went right through the opening! Another travel reducer and potty option is the OXO Tot 2-in-1 Go Potty for Travel, which is bigger around the outside edge, but has a smaller opening in the middle. In the potty configuration it can be lined with a disposable liner. When starting elimination communication, a waterproof pad is an essential item. Your baby can lay on the pad during diaper-free observation time. A lanolized wool puddle pad topped with an absorbent blanket can protect your bedding or floor from a miss. Well, at least until your baby can roll or crawl off the pad! Cloth prefold diapers can be paired with a diaper belt at home, or a waterproof diaper cover for leaving the house. Most caregivers who practice elimination communication use diapers as back-up. Cloth diapers allow your baby to feel wetness and maintain awareness of eliminating. A cloth prefold diaper can be held in place with a diaper belt worn around the waist. This sumo-style look allows you to quickly notice wetness and replace the wet prefold. Receive 20% off your order of a diaper belt from EC Wear with coupon code ECPEESY20. Your EC'd toddler may be ready to switch from diapers to training pants once they are standing and walking, and you are catching most of the poops in the potty. Training pants are less bulky and allow for more freedom of movement. My son switched to wearing cloth training pants at 12-months-old. Non-waterproof cotton training pants are a great option for home, since you can tell right away when they are wet. You can add a waterproof cover for leaving the house. Receive $5 off your order of Tiny Trainers and/or TinyUps with coupon code ECPEESY10. You can also see my full list of Small Elimination Communication Training Pants. For frequent pottytunities, it helps to dress your baby in tee shirts or dresses, rather than bodysuits (Onesies™) that snap at the crotch. I loved dressing my baby boy in a tee shirt and cloth diaper. If I ever have a girl, I will dress her in Hawaiian dresses! Baby leg warmers or long socks can keep your baby's legs warm during pottytunities and diaper changes. Leg warmers and a tee shirt make a hassle-free outfit, compared to pants that need to be removed and a bodysuit that needs to be unsnapped. Sleep gowns with elastic at the bottom can be pulled up easily for pottytunities or diaper changes. They are much easier to manage than pajamas with rows of buttons up the legs. Sleep gowns can be worn by boys or girls. A headlamp or nightlight will make nighttime EC and diaper changes easier. By choosing a lamp with amber, orange, or red light, you are less likely to disrupt your sleep cycle. We love this little remote controlled nightlight. It can either be set to a particular color or to fade through colors. That wraps up our list of 10 useful elimination communication supplies. Next is an Elimination Communication Infographic, to help you visualize EC. What have you found to be the most useful tools for elimination communication? This post is AMAZING!!! Thank you so much for sharing. I’m working on this right now with my 5 month old who has been in cloth diapers since we brought him home from the hospital. Can’t wait to get all these tools.